Built 1873-1875 by Hyazinth Michel. Opened 1875 as "Kurhaus". 1965 severely damaged by a fire, with only the theatre hall surviving. Subsequently rebuilt to the original plans. 1997 major renovation, renamed "Kongress & Theaterhaus". Used for conventions and cultural performances. Since 1960, main venue of the operetta festival "Operettenwochen Bad Ischl" (now "Lehár Festival Bad Ischl"). Front Text: "Bad Ischl. 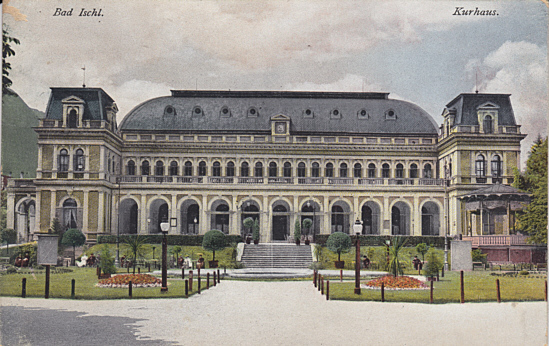 Kurhaus." 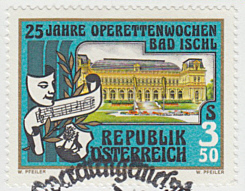 Text: "25 Jahre Operettenwochen Bad Ischl"